Series 2000 - Xylophones of the premium series. The instruments of the premium Series 2000 satisfy the highest musical standards and are excellent for use in music and grade schools. 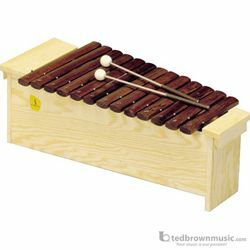 All instruments have resonance boxes of solid wood and handles for easy transportation. The handles also serve as supports for the stands. Adjusting the instruments on the stands is easy with the turn of a screw, for a quick change of instruments and uninterrupted instruction. For maximum volume, the alto and bass instruments include several proportioned resonance chambers and sound-reinforcing lips on the dividers. Only hand-selected and expertly cured Amazon Jacaranda (Rosewood) is used in the legendary Series 2000.